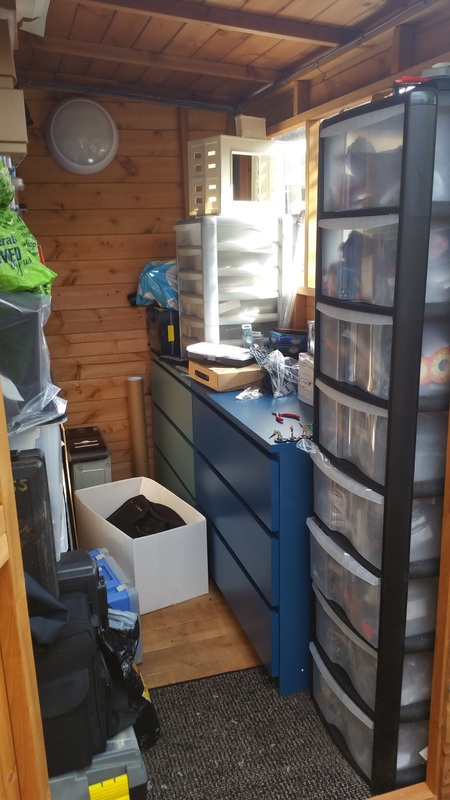 Hi everyone and to welcome to another one of my blog posts. I have decided to do a post this week as I have managed to finish painting a bunch of figures. However, it will be a small one as not much happen that is bloggable and I have only been gaming ONCE sadly. With my painting this week, I have managed to finish painting two more figures for Kingdom Death Monster (Grey and black bases) and two figures for Frostgrave (white bases). I have not built anything new at the moment as I am still waiting for the female conversion parts from Zealot Miniatures for my Tau Pathfinders. 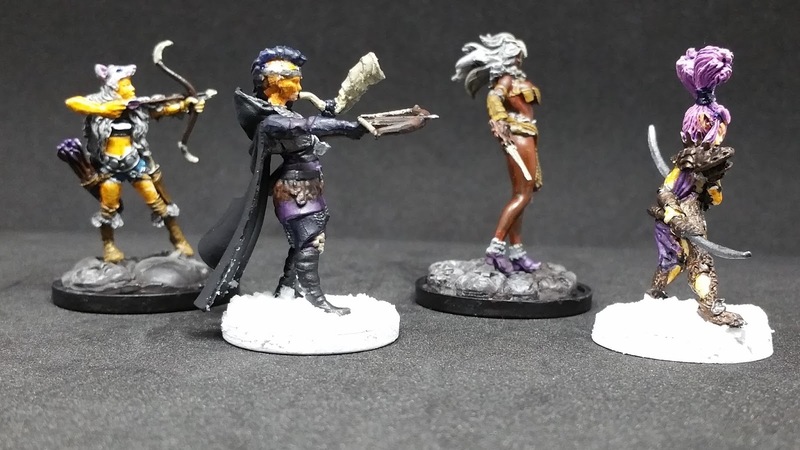 Here are the four figures I finished this week. 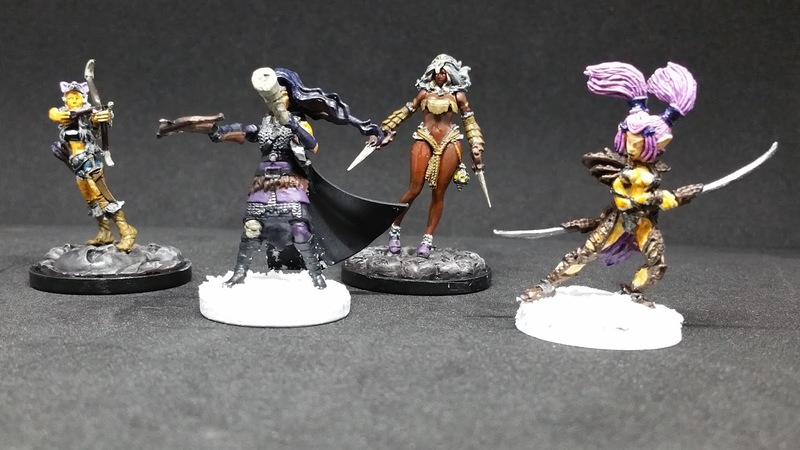 Oh and here are four out of the five figures I am currently (or about to start) working on. The fifth figure that is not there will be the Gorm. 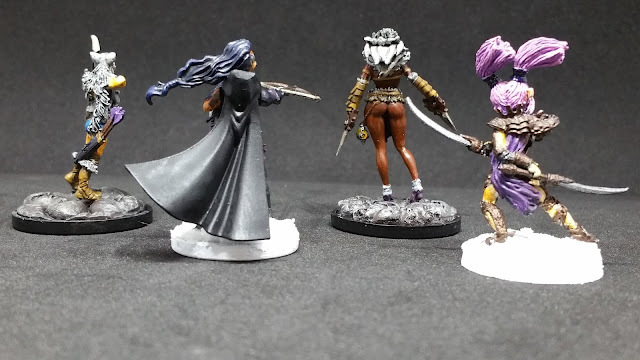 As you may have noticed, I have finally re-setup my photo box for miniatures. 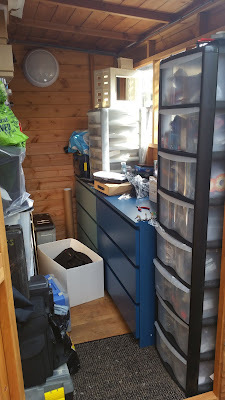 But as I have only just got it up, there will be no backlog photos this week. 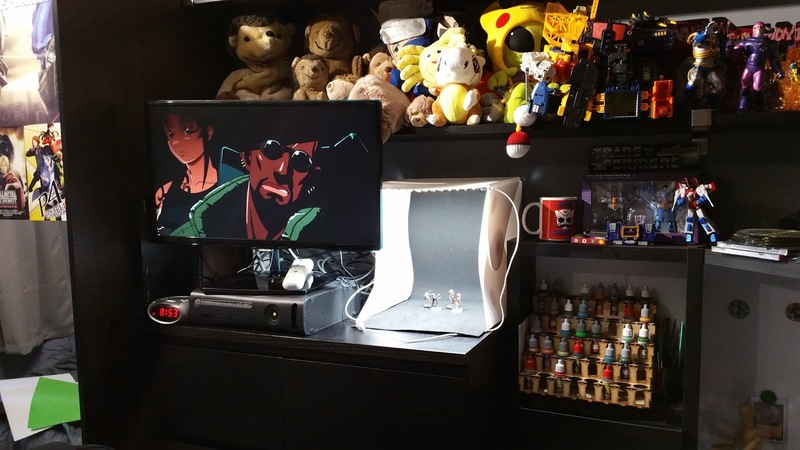 However, here is a photo of the photo box all set up next to my TV, as I am watching Black Lagoon. On Thursday, I went to York House for some games of HeroClix. This week's scenario was 500 points, three actions, not figure over 150 points. I decided to use my new Marvel Knights (Marvel Defenders Netflix characters really) Fast Forces set. 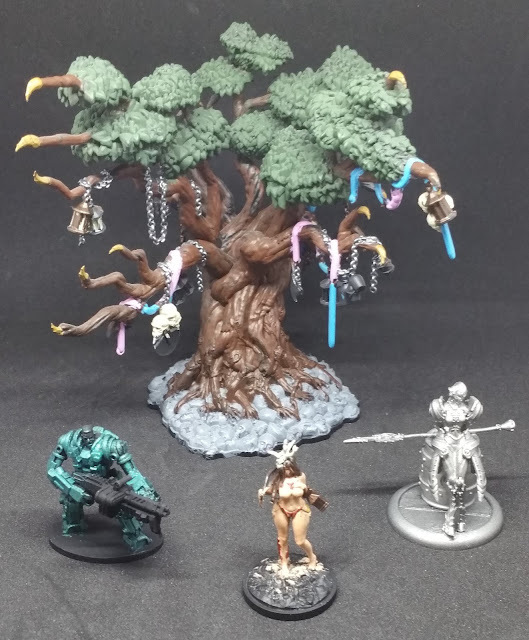 I just needed one extra figure to fill in the 50 point gap. On the first round, I was up against Michael who was using an X-Men themed team. I managed to KO his whole team, only losing Luke Cage. In fact, the only other character that took damage was Jessica Jones who healed it straight away. Also, Darren S won his game against Adrian. On the second round I was up against Darren S. He was using a Defenders themed team. At first, it looked like Darren S was winning. However, after a couple of lucky rolls from me and crap rolls from Darren S, I somehow managed to win the game. Also, Adrian won his game against his brother Michael. On the third and final round, I was up against Adrian who was using an X-Men themed team. The dice rolls were against me this game. I Could not hit with my attacks and Adrian was rolling high numbers. In one instance he needed tens to hit and he rolled eleven twice. Also, Darren S won his game against Michael. Overall Darren S won this week by points and I came second. 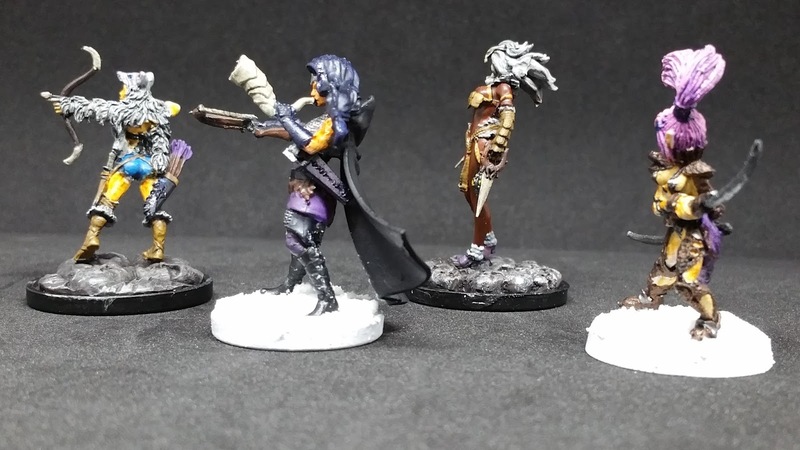 On Monday the 5th of June, I will be playing Frostgrave at Wargames Workshop MK. 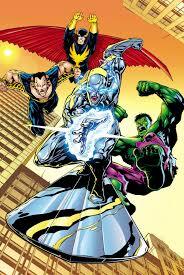 On Thursday the 8th of June, I will be playing HeroClix. All I know of the scenario is that there will be a boost to characters with the Politician keyword due to the UK Elections.